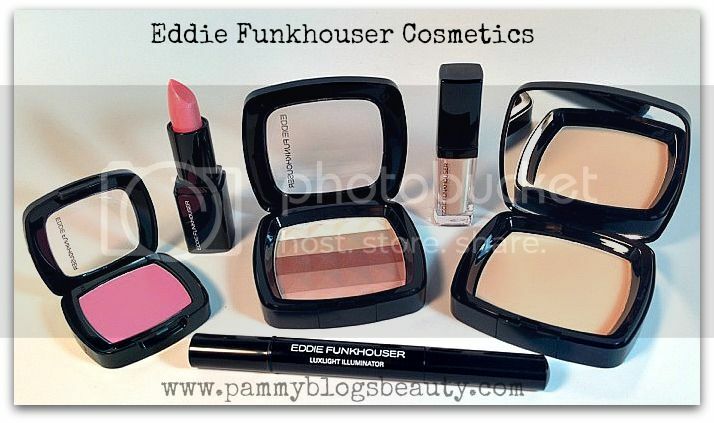 Pammy Blogs Beauty: Eddie Funkhouser Cosmetics: Website Launch and Product Reviews! Eddie Funkhouser Cosmetics: Website Launch and Product Reviews! As a fan of the new Eddie Funkhouser cosmetics line (previously available in select stores only), I am excited to announce the launch of their awesome webstite, eddiefunkhouser.com, and their launch into Urban Outfitters stores. The Eddie Funkhouser brand was developed and founded by makeup artist Eddie Funkhouser. His vision is to bring products to the market that bridge the gap between high-end prestige makeup brands and drugstore/value brands. The result? High-end quality cosmetics and packaging with a very affordable price! Seriously!!! The look and feel of these products seem so expensive...but, they are not! Well done, Eddie! Since this post is introducing many of you to Eddie Funkhouser for the first time, I sought try out a variety of items across the product range. From lipstick to powder, I am very pleased! To find out more about how I liked Eddie Funkhouser's Micromineral Foundation Powder, 16 Hour 4-Way Liquid Concealer, Luxlight Illuminator, Ultra Intensity Cheek Color, Chromographic Lip Color, and the Ultra Definition Bronze & Sculpt, please click "read more" below! Lets start off talking about face products! :) As we know, the foundation to any great makeup look is great skin. 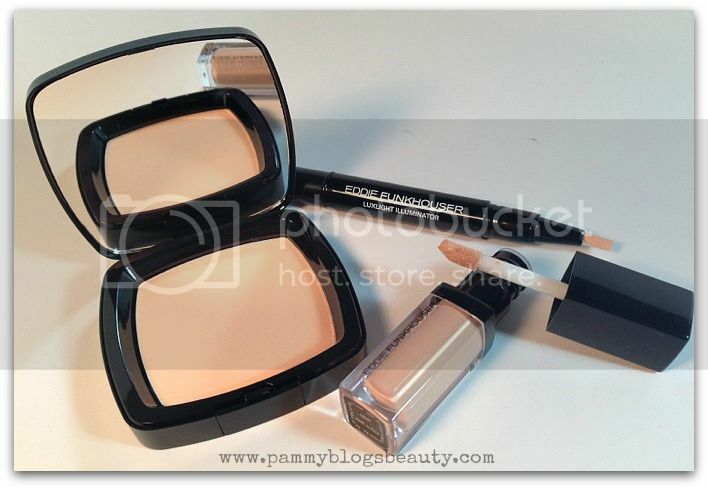 So, I choose to explore Eddie's powder foundation, concealer, and illuminator! Those are my everyday basic steps to great looking skin! As I mentioned, the Eddie Funkhouser packaging across the board, is gorgeous and very high-end looking. The products just look sleek, sophisticated, modern, and expensive. The only minor issue I have with the packaging is that with the lettering going up the side, I always try to open the wrong end, lol (I know, totally my issue really, not an issue with the packaging design...can I blame my blonde hair? lol!). Eddie Funkhouser Micromineral Foundation Powder: I choose this powder in the shade Fair which is for porcelain skintones with pink undertones. This color does work pretty well with my ultra fair skintone. However, I do find the shade to be ever-so-slightly too dark for my skin. So, while not a perfect match, it is totally wearable on my skin. I just wish it was a bit lighter. This is a common issue I have with foundation. Many brands do not come quite light enough for me. Once I blend it in, it does work though! The powder has a nice texture and gives pretty good coverage, too! It is super easy to apply and blend. Eddie Funkhouser 16 Hour 4-Way Liquid Concealer: This concealer has a nice, thick, and creamy feel and medium coverage. I tried the shade light (for light skin with pink undertones) which was just the slightest bit too dark for my porcelain skin. However, I could make it work once I blended it in. This concealer works great to cover redness and imperfections on my face. For my super-duper dark under eye circles, it did not provide quite enough coverage. I need to use super heavy-duty concealer to cover my dark circles. If you just have mild dark circles, this concealer should work for you. Eddie Funkhouser Luxlight Illuminator: This click-up wand style illuminator is designed to instantly brighten your skin and enhance your features. I tried the cool-toned shade "Candlelight" which gives a slightly shimmery luminous glow to your skin. I use it as I would a highlighter hitting the areas of my face that I want to catch light (tops of cheekbones, down center of nose, chin, brow, etc). The effect is subtle and very pretty! This product reminds me a lot of higher end items in my makeup collection that are twice the price! Eddie Funkhouser Ultra Intensity Cheek Color: Now ya'll know that I adore blush, right?! This one is just gorgeous!!! I tried out the shade "Peep Show" which is a super bright cool-toned matte pink. This is exactly the type of shade that I like to reach for this time of year! It gives me a gorgeous pop of vivid pink for the apples of my cheeks. Very flattering! The powder is finely milled, easy to blend, and looks and feels very high-end! I just love this blush and would love to explore the rest of the colors in Eddie Funkhouser's blush range! Eddie Funkhouser Ultra Definition Bronze & Sculpt Powder: This all-in-one bronzer, highlighter, and contour powder is a must-have from the Eddie Funkhouser line! What a versatile product! You can swirl your brush all over the powder for a nice bronze glow or you could focus a smaller brush over the exact shade that you want to highlight or contour your face! I like doing the latter. I just swipe a small pointy brush across the highlight/lighter shades and top my cheekbones, highlight my chin, and highlight the center of my nose. Then I take a different fluffy and pointy brush and focus on the darker shades to apply contour below my cheeks and under my chin. It is so super convenient to have all these shades in one compact! Eddie Funkhouser Chromographic Lip Color: I have this lip color in Lovefroze which is a sheer sparkling peachy-pink shade. This formula is lightly hydrating and the impact is shimmery shine with sheer color. This formula range has 8 shades and Eddie Funkhouser's other lipstick line, the Hyperreal Nourishing Lipcolor, has 6 shades.